The EAGLE WARRIOR (Guerrero Aguila) who appears on Mexico Real’s Cafe logo was inspired by “The Eagle Warriors, or Eagle Knights” who were among the most skilled and feared warriors in the army of the Ancient Mexican Empire. The eagle warrior was chosen to represent our Mexico Real coffees to transmit to you the courage, energy, vigour, brave spirit, freedom, exoticism, strength, power, self-control, and exclusivity which are characteristics of the eagle warrior’s personality and are the feelings that will arise in you when having a cup of our Gourmet Mexican Coffees every morning, thanks to the energizing benefits of coffee. The eagle warriors played an important role in creating and sustaining the huge Mexican (Aztec) empire. They were never conquered by any other warriors in ancient Mesoamerica. During the Spanish conquest, Eagle warriors were war heroes and bravely fought to the death to defend their land, people and culture. Eagle warriors were only conquered by the Spaniards because the latter used gunpowder weapons which were not known in ancient Mexico until the Spaniards arrived to the Mexican Empire. The EAGLE WARRIOR was a full-time warrior that belonged to an exclusive (elite) warrior society in the Aztec army. Only the male members of the nobility or commoners who had distinguished themselves on the battlefield could become an EAGLE WARRIOR. In the ancient Mexican empire hierarchies and social classes were very marked. In that hierarchy the eagle warriors enjoyed high status and privileges. For instance, they had the privilege of wearing fine jewellery and costumes in public, and wearing cotton and sandals in the royal palaces. They also had the right to keep mistresses and were allowed to get involved in politics. Because in ancient Mexican culture, the eagle symbolized the most powerful star in the solar system: the sun, the Eagle Warriors also were considered “The Warriors of the Sun”. Eagle warriors dressed like eagles, adorning themselves with eagle feathers, and wearing headdress with an eagle head on it. Images of eagle warriors can be seen in several artefacts and also found on murals in Mexico like the ancient Mural Paintings in Cacaxtla. Nowadays, the best preserved murals depicting Eagle warriors are located in Cacaxtla which is an anthropology site located in the state of Tlaxcala. It is located 2 hours driving from Mexico City. These well preserved murals are painted with intense colours: ochre, shedron, turquoise. They are highly complex murals representing a battle between Eagle Warriors (from the Aztec empire) and Jaguar Warriors (Mayan warriors). These murals are very striking because of the painting technique, intensity, colours, mysticism evoked and decorating richness expressed through the painting. Mexico Real Cafe was happy and proud to share a bit more about The Eagle Warriors, the Mexican Empire and Mexican Culture that flourished in Mexico before the Spanish conquest with all our worldwide lovely readers, and in particular with readers from geographically distant countries in Europe and farther away in which the Mexican culture is little known. Each time you have a sip of Mexico Real Coffee you are immersing yourself in our fascinating ancient cultures and helping to preserve living artisan products of Mexico. 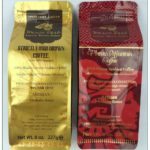 You can help us to keep alive the best moments and products of Mexico by drinking a cup of coffee from our collection of Gourmet Mexican Coffees from Pluma Oaxaca Coffee – Pluma Mountain Coffee and Chiapas Coffee – Maya Coffee.